I have sent to Johnny Groth a few times now, and I have always been happy with the results. This time, I sent a 1951 Topps Blue Back to him, and got it back signed. I only have three signed Blue Backs, because there aren't many players left living who were in that set. I mailed to Groth on March 4 and got the card back o n March 18, for a 14-day TAT. I paid his fee of $5.00. I got a TTM success back from Bert Roberge recently that helped get an old Fleer card out of my box. That box is at the bottom of the closet, so it is always tough getting in there, but sometimes I make it through. This is a 1986 Fleer, a pretty basic design, but it is a nice set, nonetheless. I also got 1980 Topps, 1983 Topps and 1986 Topps signed by Roberge. He used a ballpoint pen, but the auto is still nice. Roberge (b. 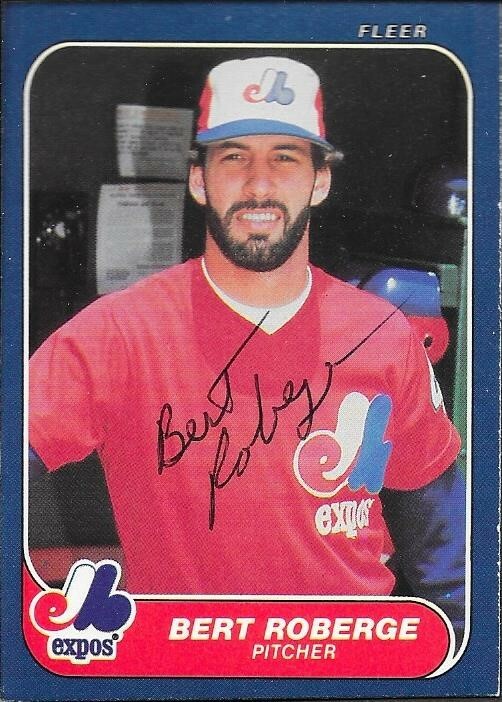 1954) played in the majors in 1979, 1980, 1982 and 1984 to 1986 for the Astros, White Sox and Expos. He had a record of 12-12 with 119 strike outs and a 3.98 ERA. I mailed to Roberge on March 5 and got the cards back on March 16, for an 11-day TAT. I saw that I had this Kevin Hagen card in my box and that he signed TTM, so I sent it off. It got damaged by the USPS when it came back, but it is still in my autograph album. 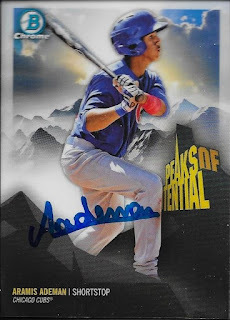 The 1984 Topps design made a comeback this year, as it was included in the inserts with 2019 Topps. It definitely is a nice design, and looks great in chrome. Hagen (b. 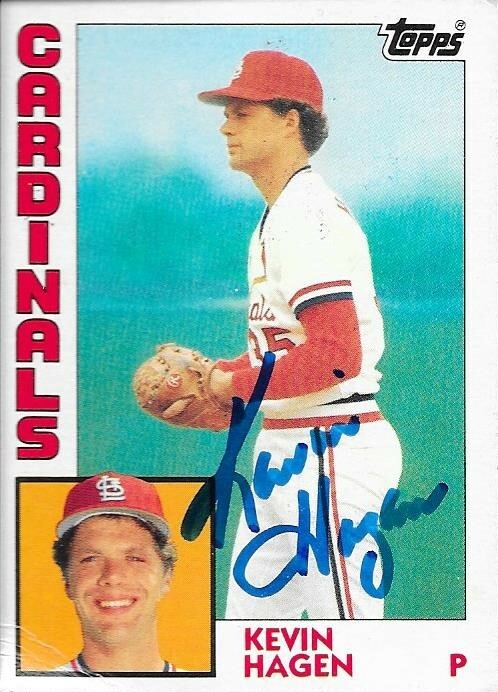 1960) played in the majors in 1983 and 1984 for the Cardinals. He had a career record of 3-2 with 9 strike outs and a 4.25 ERA. I mailed to Hagen on March 8 and got the card back on March 15, for a 7-day TAT. 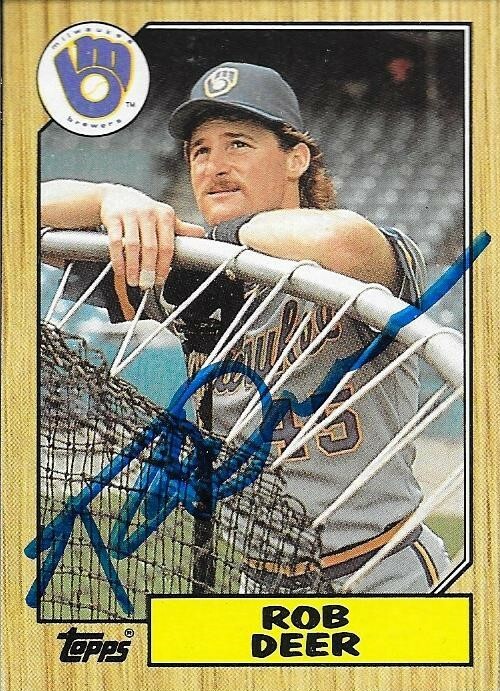 As of today, I have 460 signed cards for my 1987 Topps set. I have really made some headway with the set by using the private signings on SCN. This success came back from Rob Deer not too long ago. Deer (b. 1960) played in the majors from 1984 to 1993 and 1996 for the Giants, Brewers, Tigers, Red Sox and Padres. 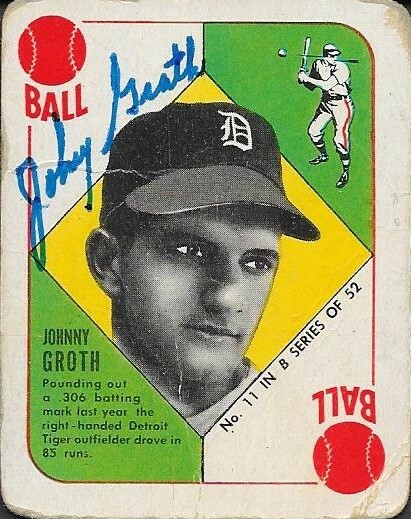 He had 853 hits, 230 home runs and a .220 batting average. I mailed to the private signing on February 13 and got the card back on March 15, for a 30-day TAT. I paid a fee of $10.00. 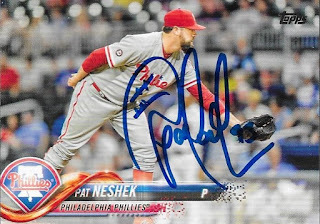 When 2019 Heritage came out, I had to get the Pat Neshek from the set signed. The card is cool as it is, but when you read more into it, it is even better. Topps wanted to throw some subtle winks into the set, like they always do, and this card pays homage to the original set in that it resembles the Lowell Palmer card from 1970. 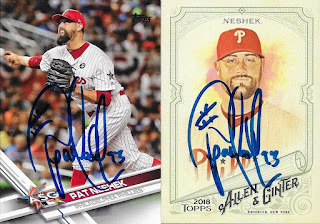 Neshek, himself, is a huge fan of that set, and was apparently elated when Topps approached him about recreating the Palmer card. The card turned out really when when signed, and I am happy to be adding it to my album. I got these two cards back from Neshek, as I always send him autos for his collection. These were really nice cards to get back from him. 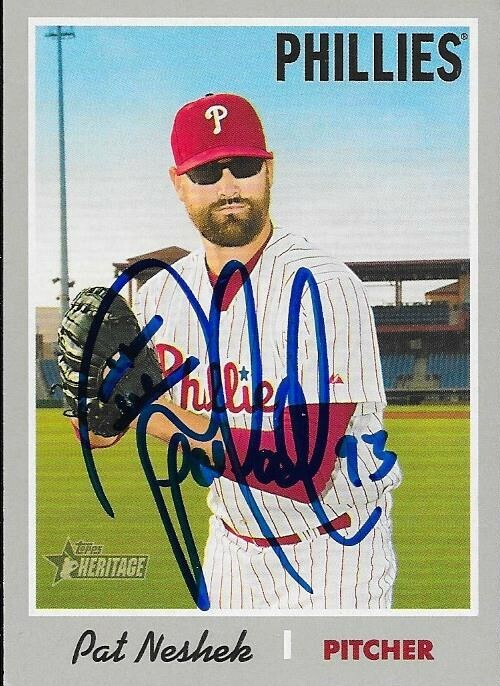 I had originally thought I was done sending to Neshek, but since the Heritage came out, I tossed this 2018 Topps in as well. I mailed to Neshek on March 5 and got the cards back on March 14, for a 9-day TAT. I sent to him via Phillies Spring Training. I have been super busy with this current homestand of the Wood Ducks. I've already used a bunch of my season tickets, which is helping me justify what I spent on them. The Woodies just wrapped up the current homestand and are hitting the road, which will give me some time to reset and relax for a bit. I didn't have too many cards of the Pelicans, but what I did have, I got signed. I have nothing leftover for them, which is nice. I was able to get a few cards removed from my box and also was able to take care of a few 50/50s. Aramis Ademan is still the toughest signature for the Pelicans, and also probably the best looking. The above 2018 Bowman Peaks of Potential really turned out nicely. 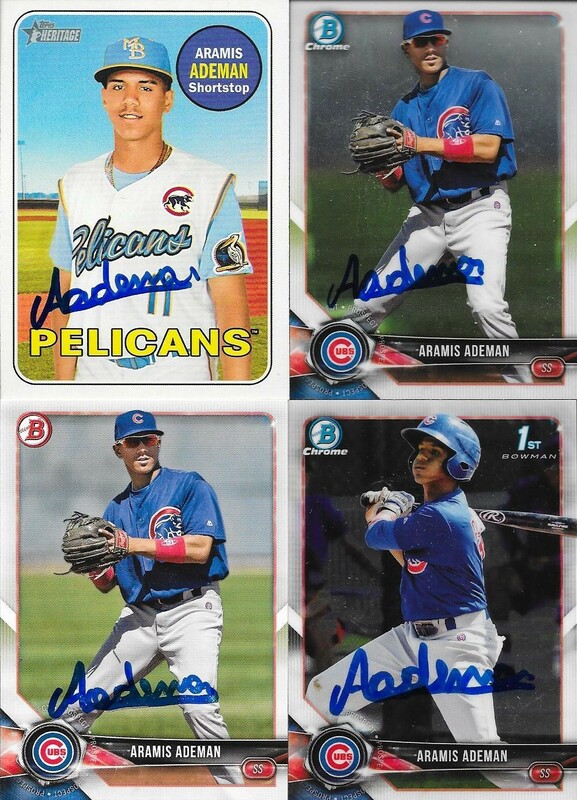 I also got Ademan on these 4 cards. He was pretty nice, but doesn't say a whole lot. He takes his time to sign a nice signature, which probably plays into why he only signed one-per. We missed Grant Fennell the first game. He came by, but said he was running late, and couldn't sign. We weren't able to get his attention after he came off of the field that game, as well. The second game, however, he walked right over, smiled and said hello. I think he remembered us from the day before. We chatted for a while, starting with how old the 2013 Perfect Game card was, and then onto the differences between being in Eugene, Oregon and Myrtle Beach, SC. Being from San Diego, originally, Grant and I joked about how he should be getting some frequent flyer miles, but the team takes care of all of that. He seemed like a really good kid. I finished off what little I had left of Alex Lange on the second day. We missed the third game, since that one was Education Day, and an 11AM game. There was some action that day, as Lange was tossed in the bottom of the second for having foreign substance on his arm. The manager was then tossed, and finally the third base coach was ejected later in the third inning. I hate that we missed an exciting game. 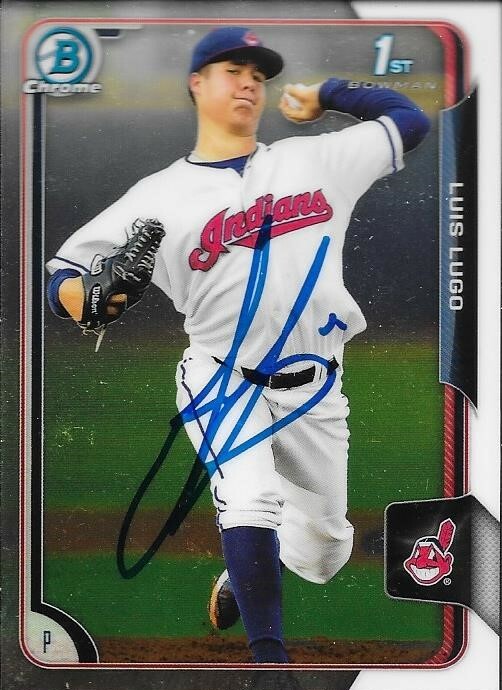 I wasn't even aware that I had any Luis Lugo cards, until I received a batch of 50/50s from Gerard. I spent a few minutes before we left for the second game looking through the 2015 Bowmans that I had, and found this one card. It was nice to get it out of my box, since the opportunity to get 2015 Bowmans signed is getting smaller and smaller. Leody is getting even tougher to graph, these days. He has started pulling a Spike Owen and is going under the bleachers and onto the field. I have strong feelings about that; I am thankful for all of the stuff he has signed for us, but skipping over interacting with all of the fans just isn't cool. He can just come out onto the field like normal and tell us no, and still sign for kids. I honestly believe he is doing this because he is upset that he is still here, instead of having been called up to AA Frisco. It is only a matter of time before he is moved, so we shall see if his mood improves. Bubba Thompson, still at one per, has been pretty cool. He at least talks with us each time. I still have maybe 7 cards left in my snap case, but I'm not sweating over getting any signed. I have just left them out of the book, and have talked to him each time he comes by. Currently, he is struggling with the bat, so instead of asking him to sign stuff, we just offer him encouragement, tell him to "go get em", and he has been seemingly cool. 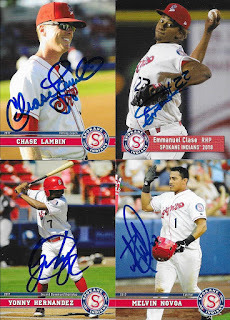 We also got some more of our Spokane stuff done. It is always tough getting pitchers done, especially this early in the season. I'm still learning faces, and uniform numbers. I've almost finished my Wood Ducks cards. Aside from Bubba and Leody being one per, I have been able to get the pitchers that I have needed. The Wood Ducks seem to be a pretty good team, so far. The pay a lot differently under Corey Ragsdale, than they did under Spike. I think I like this team more than the one that was here last year, but it is still early, so I am reserving judgment. Still, I love the Wood Ducks altogether, and am so glad that I made the decision to buy the season tickets. 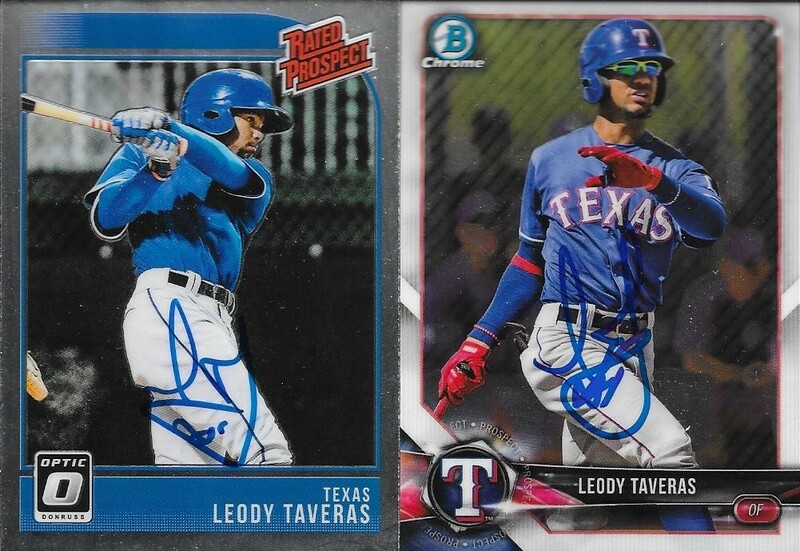 Another Spring Training TTM success added these two prospect cards to my collection. I had heard that my friend, Dugan, was going to send to Brusdar Graterol, so I found a couple cards and sent a few, myself. They didn't take too long to come back, which was nice. I got Graterol on a 2018 Heritage Minors and a 2018 Bowman Draft. Graterol (b. 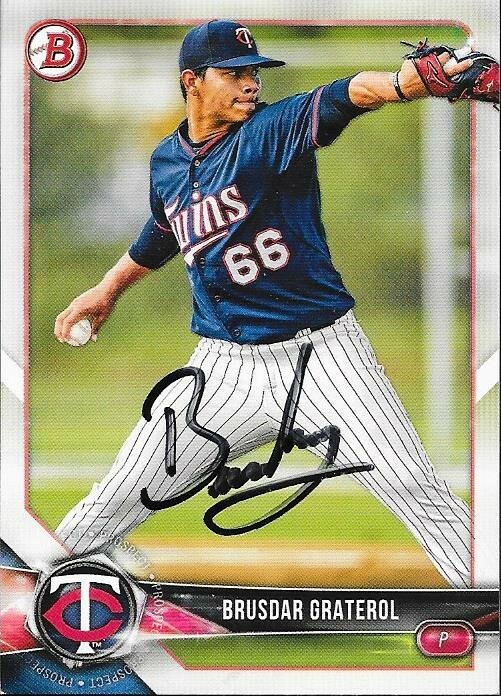 1998) has been in the Twins system since he was 16. 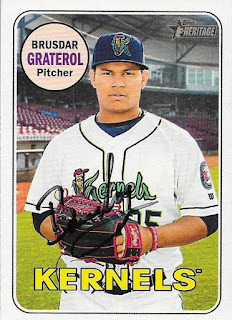 He played for the Dominican Summer League in 2015, then moved up to Rookie League in 2017 (he didn't play in 2016), A and High A in 2018, and AA this season. Overall, he is 13-6 with 179 strike outs and a 2.59 ERA. 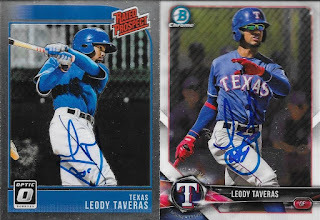 I mailed to Graterol on February 27, and got the cards back on March 14, for a 15-day TAT. 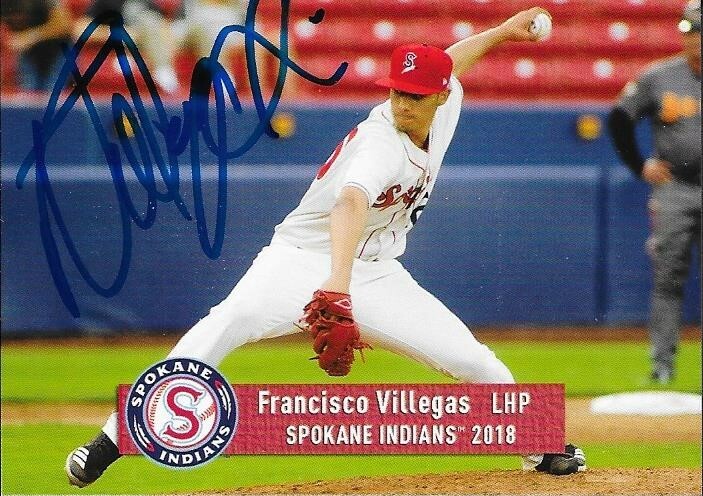 I mailed to him via Twins Spring Training.